Any time I find a great-fitting and flattering oversized sweater or knit I seriously do a little happy dance in my head. They are surprisingly hard to find, yes? This little H&M knit is one of my favorite finds this fall and I will be wearing it as much as society deems acceptable! There is limited sizing left in the stripes online, but all sizes are still available in the black (which I'm thinking about buying as well). I hope you all have a great week! I'm definitely not ready for the weekend to be over. Love this look, especially with those boots. Super pretty! Also, what kind of camera do you use. The pictures are soooo clear! I so agree! It's so hard to find a good oversize sweater but this one looks perfect :) Will have to go to H&M soon. This is such a chic look. I love the color of your jeans! And yes...oversized tops are hard to find if you want them to be flattering. Sometimes they just end up looking boxy on me...but it totally depends on the fabric and how it drapes. Cute casual look, you look pretty as always. I'd say my fall uniform is very similar to this too–great jeans, booties and a comfy sweater. I love the leather detailing on yours! Oh yeah love the shoulder detail. I went in to H&M last weekend and left $85.00 poorer. I'm loving the sweater and bag...so cute! I definitely feel you with the excitement for oversized sweaters/knits - they are by far the best :) Loving your booties! I'm so happy you found my blog because I love yours too! This outfit is so simple but adorable, I'm ordering those booties ASAP! Oh that sweater looks oh so amazing! H&M selling online, damn it I wish they'd just bloody sell to Australians already! Gahhhh! 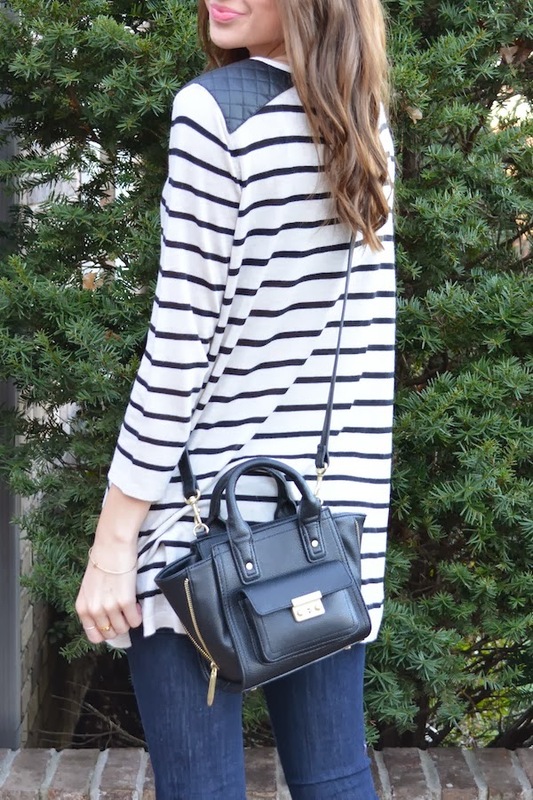 You look SO cute - love that striped top and those ankle boots!